Hostelling International Boston - Chinatown is a new hostel, just opened in June 2012 in a great central location near Boston Common, Chinatown, the subway and most of the city's sights. This clean, modern and purpose-built hostel offers personal lights and power sockets at each bed and a 'great atmosphere and lots of kitchen and common space for socialising, cooking, playing games or doing work on the free Wi-Fi', according to one Hostelworld user. We like that this hostel is actively environmentally friendly. 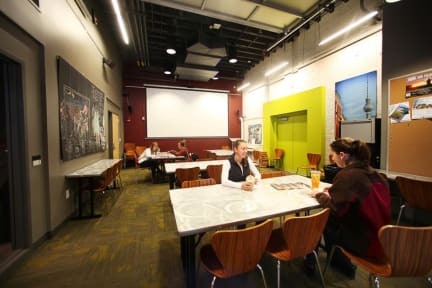 Hostel commons spaces include a pool table, a TV room, laundry facilities, and a spacious kitchen to prepare meals. Our lobby features a coffee bar and baked goods. We offer a wide variety or events and activities for our guests and local community members. It was great, better than expected! The common areas were fabulous and I wish I'd stayed more time to be able to participate in the activities organized for the guests. The bathrooms were super clean and comfortable. The beds were too. I loved H.I. Boston. The staff go out of their way to make sure you have things to do and the whole place was clean and has plenty of activities to do at the hostel on a rainy day. Great stay for my first time at a hostel. The staff were kind of rude though. Great place in a nice central location. Daily activities and tours are really good and well run (may be different during winter or summer months). Aaron made all the difference with my stay in Boston, was really welcoming and full of advice on what to do in Boston. His walking tour was a real highlight, as I learned so much about the fantastic history of Boston. Would recommend anyone stay here, really good for solo travellers, as the majority are very friendly. a classic backpackers hostels with everything you need. Great breakfast facilities, clean comfortable rooms with lockers, ample bathroom facilities, and lots of in house activities and tours arranged. Everything in Boston is expensive, so good value for money given the area so don't be put off if the price seems higher than average for a hostel stay. Great location(close to South st.-8 min walking, less than 20min to Cambridge), very clean, perfect cafeteria, and safe! 기차 타고 보스턴 왔는데 넉넉하게 십분 정도 잡고 걸으니까 바로 숙소고, 멀리서도 오렌지 H 간판이 보여서 찾는데 어렵지 않았어요. 보스턴은 밤에도 안전한 편인 것 같고, 밤에 들어왔을 때도(밤1시 정도) 거리에 사람은 많았어요. (금요일이라 그런걸수도 있어요) 방 안에도 화장실+샤워실이 같이 딸려있는데 방 바깥에 복도에도 여러개 더 있어서 샤워 기다리거나 할 일은 없었어요. 수압이 살짝 약한 것만 아쉬웠고 헤어드라이기도 안에 있고 변기도 잘 내려가고 그리고 직원 피드백이 빨라요. 음식은 사들고 오면 냉장고에 넣어놓고 먹었고 여기 아침에 식빵, 베이글, 시리얼 제공해주고 음식 들고 오면 간단하게 조리할 수 있어서 좋아요. 락카 자물쇠는 들고 와야해요. 가성비 짱이었어요! I had a great one-night stay at this hostel! The bed was comfortable and the sheets were clean. The bathrooms were cleaned regularly and were in good shape. The breakfast was basic but good. The lobby area downstairs was spacious and full of comfortable chairs and couches. I didn't join any of the social activities since I was only there for one night, but the atmosphere still felt very friendly. This was my first time staying in a hostel and I was very pleasantly surprised. The Saturday night "historic" pub crawl (it's not actually historic) had a big turn out was a really great way to meet people. The hostel itself is excellent, beds are good and there are a lot of bathrooms on every floor. The only criticism I have is that the breakfast was just white bread and mini bagels and some questionable apples. Coffee also wasn't great. Staff was friendly. Definitely would stay again! 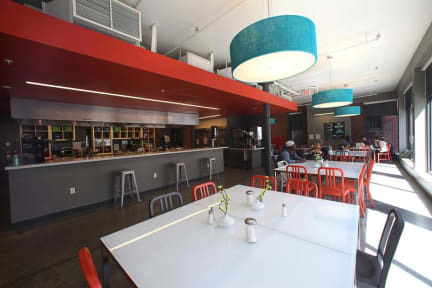 Well located hostel in central Boston, everything is with in walking distance, bars, shops, and tourist attraction. There's lots of activities to do there and the manager is friendly and willing to talk to everyone to know what he can do to make your stay in Boston and at the hostel a good one. This hostel is way over priced. The Hi in New York and Chicago was less expensive. Toilet/shower areas weren’t the cleanest. Didn’t have much of an atmosphere.